We had our conference with Kate's transplant doctor, nurse practitioner, and coordinator today. It was a long meeting - well over 2 hours. With an 11 month old walking baby. Alex and I played pass the baby back and forth while trying to absorb everything everyone was saying. Overall, Kate did good...if by good you mean puking everywhere, walking over to her doctor and attempting to pull up her skirt, licking Alex's shoes, and licking the chairs in the room. Sigh. Like I said, it was a long appointment! Alex and I were shocked to find out that Kate will be admitted to Texas Children's August 9! That's in 2 weeks! For some reason, my mind was set on a September transplant and I was totally caught off guard! I've been very overwhelmed at the thought of getting everything ready in two weeks! We will be spending a decent amount of time at the hospital the remainder of this week and next week. Kate needs a lung test (can't remember the name but she will be sedated), a chest xray, a kidney test, and a test on her heart (also sedated) before chemo can start. Days leading up to her transplant will be counted as -X days. Meaning August 9 is day -10 (and today would be day -24). Her transplant is considered day 0 and then the days post transplant are positive days with day 100 and day 180 being major milestones. We will be in the hospital for at least 6 weeks; longer if Kate has any set backs. I can't believe that everything has worked out so Kate's re-birthday will be exactly one year after our lives were forever changed. August 19 will always be an extremely special day for our family! And, you better believe all of her first birthday decorations will be used to decorate her hospital room as we celebrate the end of her first year and the start of her new life! I also want to say how blessed we are by Kate's donor. Not only is he graciously giving Kate a second chance at life, he is going above and beyond his call of duty in my opinion. He has responded to every phone call from the national registry within 24 hours and has had every test done within that same time frame. His promptness is the only reason Kate is going to transplant so soon. Donors have to remain anonymous for at least a year. At the year mark, both the donor and recipient have the ability to agree for personal information to be released. I pray that Kate's donor is willing to meet us in the future! I will never be able to thank him enough but, I would love to give him a big hug and make sure he knows just how thankful Alex and I are for his decision to donate. Until then, I will continue to pray for him, and his family, daily. God knows who is giving Kate this second chance - He has his hand in every step of this process. He will hear my prayers and cover our donor with His grace and love during this time! This just made me cry. I want to give him a hug, too. What a selfless man giving your sweet girl a second chance at LIFE! Oh my goodness - I got chills just reading this...I will be praying for Kate and your donor...I am so excited that she is getting her transplant and new start!!! I was brought to tears reading this. I'm sure you're anxious to get the process started and over with, but you must be really scared as well. I pray that God really carries and comforts you, Alex, and Kate during this time. I will continue to pray for you. I am overwhelmed with everything your family has gone through. Even though it is very soon, I'm glad Kate will begin healing so soon. 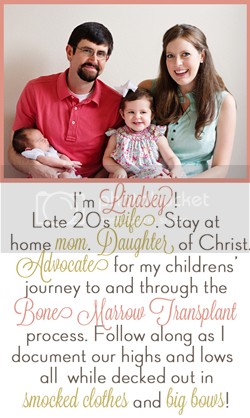 Our family is praying for the three of you and for the donor. You don't know me, but I taught Alex many years ago and I've been following your blog for a while now. I always liked Alex so much. He was such a nice young man...very personable, respectful and kind. My prayers and thoughts are with Kate, you and Alex. God will watch over your little girl. I'm sure of it. This brought tears to my eyes. Thank God for this plan, for this miracle happening. I am so glad that she will be getting her treatment so soon! I cannot begin to imagine what you must be going through but know you are in my prayers. So many emotions are connected to this blogpost! I am SO SO SO grateful for the donor. What an incredible man to give such a gift. Praying for you nonstop. And let me know what I can do from far away for you. Wish I was closer, but you know I love you to the moon and back!! We love all of you very much!! I'm a relatively new reader and just catching up on your story! What wonderful news about Kate's transplant! Such a blessing! Lots of tears over here. So excited that everything is happenign so fast. Lots of prayers to you all! Oh this brought tears to my eyes. How awesome that she will be giving new life on her birthday?! I know you are so anxious to get this out of the way. But it will come & go before you know it. Hang in there, Mama! Stay strong during the next couple of months - you are already stronger than I ever think I could be as a mother. As always, prayers sent your way! Seriously Lindsey- you, Kate & Alex are warriors! I am so thrilled that you are able to move fwd with a perfect match. This wont be easy but you guys will be okay and have so many people praying for you all. If there is ANYTHING I can do from afar, please let me know! wow, I am in tears reading this. I am so happy for your family and praying that there are no setbacks. Your sweet babe deserves a long healthy life after all of this. I will continue to pray for her speedy recovery and for your sanity and strength through all of this. I cannot begin to imagine how hard all of this is for you and your husband. I have been reading your blog for awhile and couldn't help but comment today! I am so happy for you, Alex and Kate! Who could ask for a better birthday present for Kate than a second chance at a healthy life! My prayers are with all of you and her amazing donor! What an amazing man. I think you are right in there must be some special reason he is so eager to help. What a beautiful thing! This is all so amazing! What a great birthday present for sweet baby Kate to get her new healthy life on August 19th! I will continue to pray for your family and the donor! I cried happy tears reading this post! My 16 month old daughter Brianne and I ask God to watch over and heal baby Kate every night when we say our prayers. We will also pray for her selfless donor. This is amazing news! It just confirms that God has great plans for little Kate! Thinking of you and that precious little girl. Your strength and courage is an inspiration. You are handling this so well! Are you still working? Praying for Kate. What an amazing thing this donor is doing. And how special that her transplant will be on her birthday! Your strength is incredible. Many, many prayers! I think Kate and her donor plus their families have a lot of people around the world praying for them. Wonderful news! Praying for you, Kate, and Alex. Lots of love to y'all. Wow. I can't believe her transplant is on her birthday. Will be praying for you all in this time period. Noticed you looking for what she can wear in the hospital - You can still use zippered jammies, but you'll have to poke a hole in the crotch for the lines. That's what we did when our LO was in the NICU. It works nicely, because you can unzip very quickly if they need to reach her chest in a hurry. I cried a little bit when I saw that Kate will be undergoing the transplantation on her first birthday. And then I cried a little more about the donor. I'm so heartened to see everything falling into place. You all are always in my thoughts.